I was recently asked to contribute some art work for an upcoming music/art festival to be held at Scott's Mill Park. The festival entitled "Cornstock" (playing off the Woodstock concept) is shaping up to be a unique gathering of artists and musicians (open to the public). 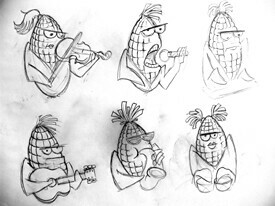 These are very, very rough concept sketches of some corn characters playing instruments. I plan on posting the progress of this project up to final completion. It is a great idea - showing and idea from conception to completion.